Whether you’re building a world for a tabletop role-playing game, like Erylia, or as a setting for a novel, every city needs a reason to exist. For a tabletop role-playing game, a good reason to exist is conflict. In general, if you put something in front of the players, there is an unspoken expectation that it is important. They are meant to interact with it. One of the easiest ways to do this is to have something wrong in the city, and it doesn’t always have to be a major event. If you’ve been listening to the podcast, there are a few examples of this in the city of Mieveht that have come up so far. An interesting thing in regards to that is that the players aren’t even interacting with the most major conflict in the city right now. In fact, in the grand scheme of things, the focus of the story so far has been very minor, a man’s daughter has been missing for a couple days. Meanwhile, parts of the city are in a major upset because a noble was found dead during another nobles party. This major event was even caused by the players direct actions with the story previously. It ties into another important point, not so much for world building, but for story telling. Actions have consequences. Things happen even though the story is focused on something else. The death of that noble has created a domino effect that I intend to have impact the story for months of in game time to come. Not every city needs to have a conflict as it’s main draw however, though every city would have some reason to have one, even if minor. Some cities can exist solely to be a tourist draw. They can be a place for the story to settle down in between story beats. If you’ve got a city like this in your setting, I suggest having things for the main characters to still do their however. Maybe they are going to a city that is focused on crafting to give them a place to learn and hone their skills, as well as shop. Or perhaps the city is a little more luxurious, full of rich and powerful people who come here to vacation and take part in sport, gambling, and… other… luxuries. I honestly wish I had a better map of the continent of Syvahl to help describe some of my points here. You can try to follow along with the map below, but hopefully my words will convey my meaning well enough. The city of Mieveht is a terrible example for this, so I will use the setting for our upcoming story arc to describe my points here. In the next story arc we will be joining a group of adventurers who are currently in the Khrysahl Valley in the north east of Syvahl. The key areas in the valley are the city of Riven, the villages of Lumbridge, Iron Quarry, and Khrysahl, as well as the Espont Lighthouse. A short summary for this section is ask yourself, what value does this town bring that would allow it to form an actual town, and does travelling too and from this town make sense? Riven is the largest city in the valley, though it’s population is only around 5,000. It is located around a bay on the mouth of the Khrysahl River. I chose this location for a few reasons, all of which contribute to it being the largest settlement in the area. Being on the mouth of a river gives it access to fresh water, as well as flowing water for power. The bay gives it a relatively open area to house the trade ships that dock their on their way up and down the coast. Trade ships have bolstered the cities economy, allowing it to grow to the size that is has. The small village of Lumbridge lies to the north of Riven, nestled into the forests at the base of Dunatis’ Ring. Lumbridge has a small population of under 200 and exists solely to work the forest and supply wood for Riven. The village is about half a day’s journey from Riven with an empty cart, and about a full day away once the cart is full. It’s positioned so that a cart can leave Riven empty, arrive and be loaded up, rest, then leave Lumbridge the next day and return by night fall. The story is the same for Iron Quarry. A common theme I use for settlement placement is that it can be reached within a day of the nearest settlement. I do this because I feel like in a time without cars, and especially in a world where there are more creatures that will kill you if they catch you sleeping, most settlements will be formed around a natural resting point between larger cities. I wish I could remember the source for this, but I remember hearing about an area in the mid-western United States where this was clearly the case. It’s a string of small towns that run down the valley of a mountain range, each about 20 miles apart. The news segment went on to talk about how they were spaced so evenly apart because that is how far an average person could travel at the time they were settled. Khrysahl is one of my leisure villages. It is a small village higher up in the mountains on the banks of the Khrysahl Lake. The lake get its name from its crystal clear waters. Though the village is small, it is quite prosperous as a vacation home for quite a few wealthy merchants who have large mansions and villas built along the lake’s shore. Aside from fairly consistent nice weather, and beautiful, pure water, the lake is home to some unique fish and the ground grows some of the best tasting fruits imaginable. It is about another half day from Lumbridge, meaning it can be reached within the day if you are in Riven in the morning. For the more wealthy, there is also the option of taking a ferry up stream directly into the lake from Riven. The Espont Lighthouse is an area that doesn’t exactly work in the conventions I have laid out so far. It can technically be reached within a day, but not the most safely. There is no trade that happens here and no sort of luxury to draw people to it. It exists where it is solely because while drawing this area, it is somewhere that I felt would require a lighthouse. Without giving too much away, it actually no longer functions, hasn’t for years, and no one Riven has sent to investigate has come back alive. 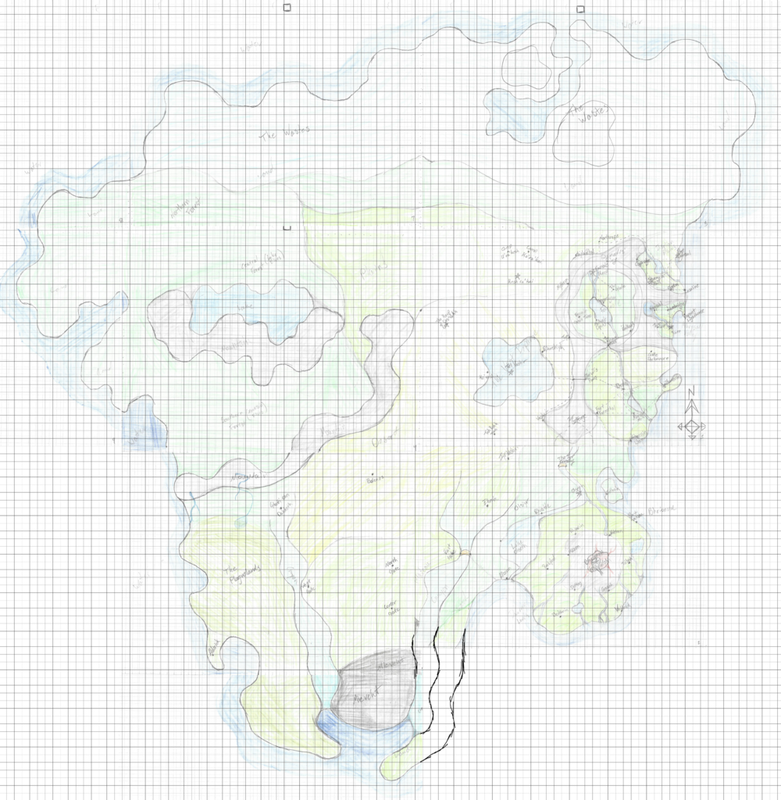 Since I have started putting a bit more work into fleshing out the cities on Syvahl, especially Mieveht, I have had some “sticker shock” over some of the numbers that make sense for the sizes I had envisioned. One of the first things I had to get myself to do to reconcile this is remind myself, I don’t need to know a story for absolutely everyone that exists in a town. I’d like to think that I can get away with some of this for the show because I seem to do a fairly good job with improvving a character on the spot when asked. Some examples of these are Brit, Jeff, and the two guys that party ran into leaving The Commons who’s names I can’t remember because they were never important. However, something I have done to a small extent and plan to do to a slightly larger extent now, is plan for some more in depth characters in a given settlement. Some of this hinges on the idea that a settlement should have conflict. To have conflict, a settlement needs people with enough depth to them to have problems. Depending on the size an importance of a settlement, I recommend coming up with 3 to 5 characters that have a name, some background, and a potential problem they have. These characters are meant to fall somewhere between a core NPC, like Cassien or Xanphia, and a completely improv NPC. They are someone you can grab if you need to throw a hook to your players when they aren’t near a plot point you already had in mind. Aside from your somewhat fleshed out NPCs, I recommend having a list of at least names for improv NPCs. I’ll admit, even though I have one of these, I am terrible at remembering to use it, but there’s a few reasons I recommend it. For starters, giving an NPC a name will instantly make them seem more important to the players. Having a list handy also lets you avoid some of the absolutely terrible improv names I have chosen, like Brit and Jeff. You can also trick your players into thinking this person mattered all along, as you “look through your notes” to see where you “totally wrote down something about this guy.” Lastly, if you have a list, remember to use it, and leave space, you can jot down some notes on the NPC so you can use them again later and remember who they were. With this method, a completely improv NPC can easily be elevated to a more core NPC. All of this will help your settlements feel more alive. I wont claim to be the most knowledgeable on this topic, in fact, I’d love to hear some different opinions on what I deem important for building a city. For me and how I work however, I find the most important steps to take when building a setting are to: give it a reason for the story to even be there, make sure it makes sense both geographically and logistically, and to create enough NPCs in advance to make it feel alive the first time you’re there. This is a huge topic and I expect to revisit it in the future.